Caption slip reads: "Photographer: Swaim. Date: 1958-01-17. Reporter: Swaim. Assignment: Camellia, Temple City. 17-20: Six-year-old girl, one of seven little anonymities, curtsies for judges while six others boys and girls wait their turn in line, competing to be king and queen of the Temple City Camellia Festival February 21, 22, 23. 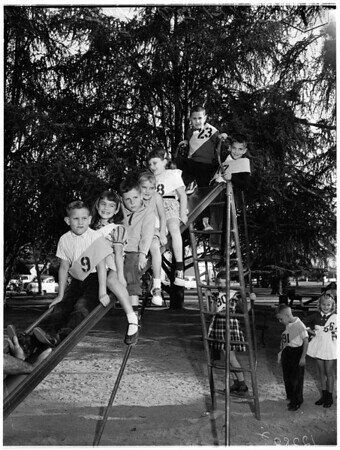 1-2: Another seven contestants, known to judges only by numbers, on park slide during annual 'play day', (elimination contest for king and queen of Camellia Festival. There are 225 contestants".